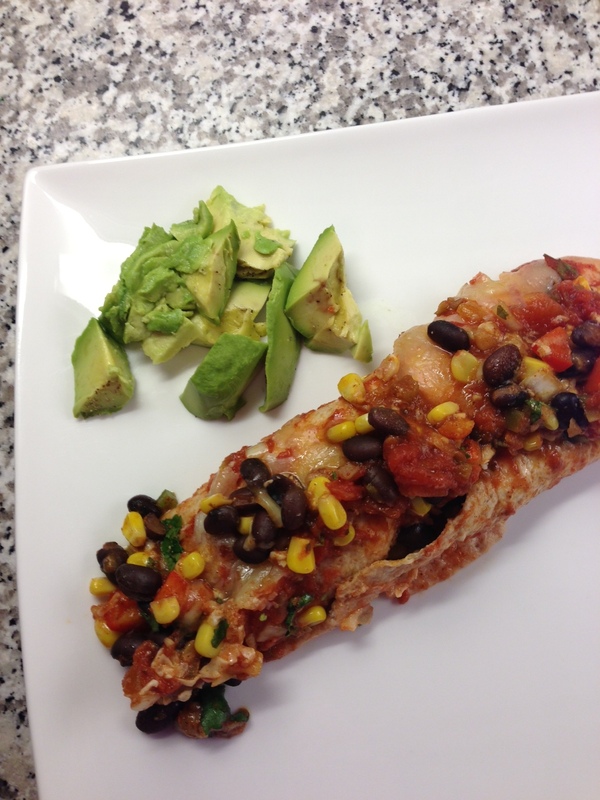 I’ve had a few requests to post my recipe for Black Bean Enchiladas since I put it on Instagram a few weeks ago. This recipe is super simple (and delicious) because unlike fajitas, you mix all the ingredients together in one bowl, wrap in tortillas and bake everything all at once; perfect for busy weeknights. I adapted this recipe from The Kitchn (amazing food blog), and they feature it as a slow cooker recipe, but you can also bake them in the oven, which is what I did. This recipe is considered a healthy choice, and perfect if you’re trying to cut back on your meat intake (trust me, you won’t miss it). Black beans are a great vegetarian source of protein, and their high fibre content makes them easier to digest than meat protein such as beef, pork or chicken. Proper digestion & elimination is the key to good health. Improper digestion leads to toxic build-up, which can cause bloating, gas and acne. 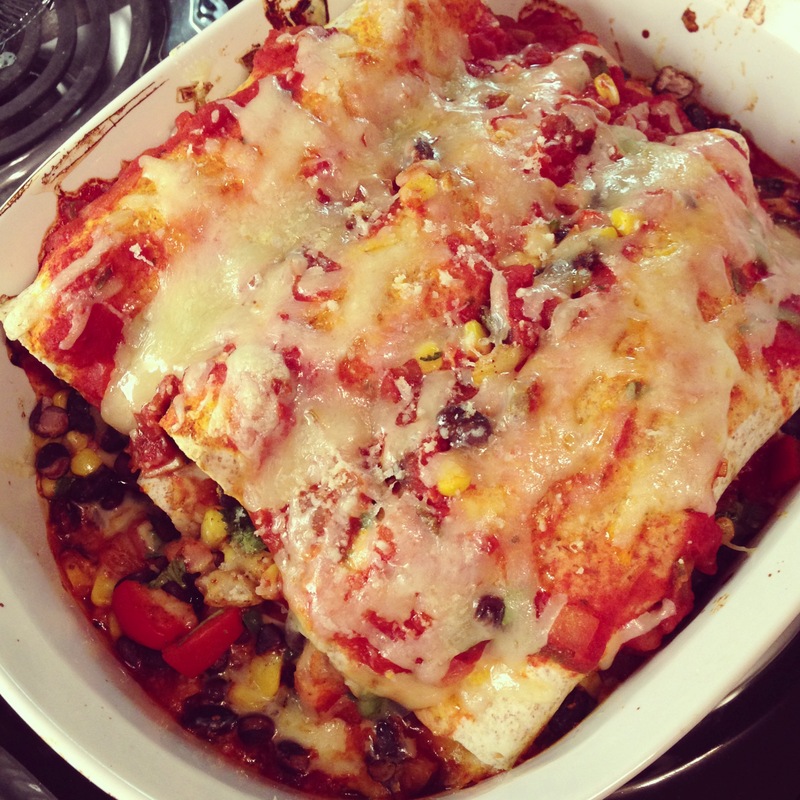 Another reason this recipe is a healthy choice; it uses salsa instead of enchilada sauce. Salsa is one of my favourite condiments because it’s tomato-based, (tomatoes are high in the antioxidant lycopene), flavorful, and low in calories. The organic salsa from Costco is my favourite. This recipe is loaded with other healthy veggies as well: red pepper (high in vitamin C), organic corn kernels (high in fibre & antioxidants) and avocado (rich source of B vitamins & healthy fats – good for your skin!) – enjoy! Step 1: In a large bowl, combine beans, onion, peppers, corn, cilantro, and spices – stir to combine. Step 2: In a large casserole dish, pour and spread 1 cup of salsa on the bottom. Step 3: Fill each tortilla with about ½ cup of the mixture or more (depending on how full you want them). Roll and arrange the tortillas in the bottom of the dish, on top of the salsa (should fit 3-4). Step 4: Pour another cup of salsa on top of the arranged tortillas, and sprinkle with ½ cup of shredded cheese. Repeat Step 3 with remaining tortillas & mixture and arrange them on top of the bottom layer. Pour another cup of salsa on top of your second layer of tortillas, but wait to sprinkle the rest of the cheese on top until last 10 minutes of cooking. Cover dish with glass lid or aluminum foil and bake for 20 minutes. Remove from oven, sprinkle remaining ½ cup of cheese on top, and bake uncovered for an additional 10 minutes. Serve on a bed of organic baby spinach (or any greens you like) and top with remaining salsa & diced avocado. This recipe makes for great leftovers, and will keep for 1 week in the fridge. SUCH a delicious recipe!!!!! Thanks for sharing!!! We have had this recipe a couple of times now my husband and my 3 kids aged9 through 21 months love it!! !